If you wonder How to go Vietnam, Da Nang certainly is one of the best choices to have the full moments in this poetic country. Talking about Danang, tourists often think of the Han River bridge, Ngu Hanh Son cave, Linh Ung Pagoda … But few know that, not far from the city center, there is a place so romantic that it is named as “the Mongolian steppes” of Vietnam. 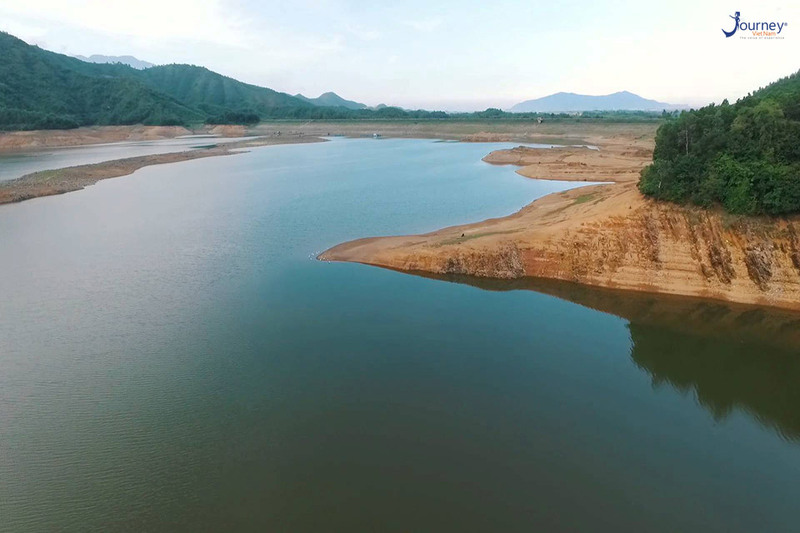 Ho Hoa Trung is in Hoa Son and Hoa Lien communes, Hoa Vang district and located about 20 km from the center of Da Nang city, This is an artificial lake that supplies water to the people to irrigate fields and cultivate. 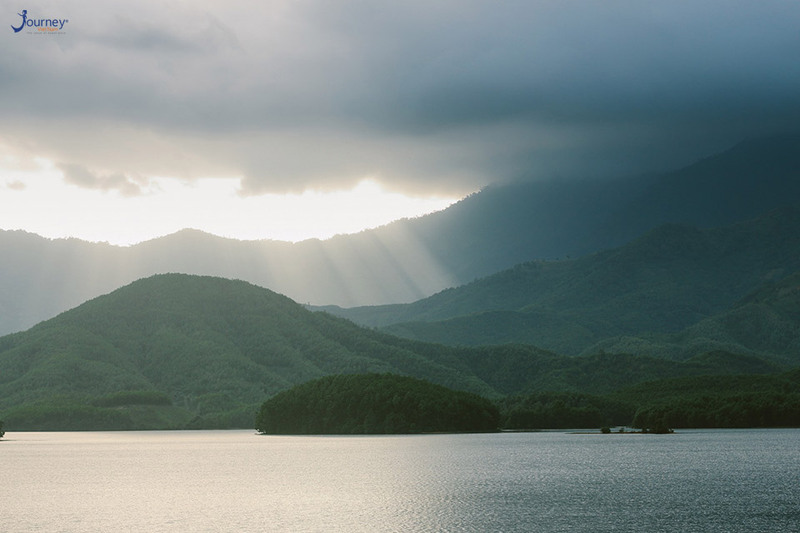 Come to Hoa Trung Lake, you will feel you get lost to the fairyland. The scenery, the cool air make this place a great stopover for Da Nang people and visitors. Ho Hoa Trung is still beautiful, peaceful and pristine. Space is beautiful as an ink painting with green grass and sunshine. This is the gift of nature for those who want to explore the unspoiled nature, be immersed in the idyllic countryside and enjoy the peaceful moments. 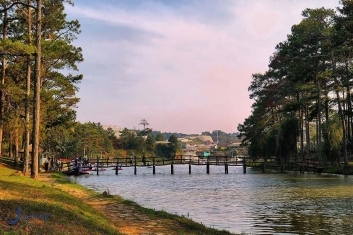 Therefore, if you want to find a place to relax, away from the chaotic city, Hoa Trung Lake is an ideal destination. The special attraction at this site is the lake surrounded by artificial floating islands with smooth green grass and undulating hills. Thus, come here with the guide of Tours in Vietnam and lie down on the soft blue grass, watch the starry sky in the quiet night to forget the chaos of everyday life. Ho Hoa Trung has two seasons: Dry Season and Rainy Season. Hoa Trung Lake every season, every month is beautiful, but the most beautiful of which is the dry season in October and November each year. In this season, the water is almost gone and the whole lake changes. At this time, visitors will admire a picturesque beautiful scenery. The wind blows slightly, the lake surface ripples. Water is cool under the sun. Sometimes, in the blue sky, a herd of white stork appears and then flies down on the grass to find the food. Under the green meadow in the afternoon sunlight, the white storks’ wings are fluttering, that creates a scene of peace, making people just want to leave the crowded, noisy town to come here. However, the tranquil beauty in Hoa Trung Lake is not only a look of grass but also pictures of cowherds, buffalo herds in the morning and the evening. The dry season is also a great time for camping, picnics in the green prairie. Thus, it is better to take Vietnam Small Group Tours. You only need to prepare food and drink and then set up tents, even overnight at the lake to enjoy the scenery in this fairyland. In the rainy season, the surface of the lake is immersed in the blue water. Visitors can see the mountains covered by the green color of trees. The lake’s surface is like a smooth mirror, all year is covered by mountains. Floating artificial islands looks like the dots for the lake. The fresh blue sky, the light wind, and the brilliant sunlight are printed in the water, that makes the scenery more romantic. In the rainy season, tourists come here together to take a boat trip on a beautiful small boat. These are boats made by local people, they use boats to visit fish farms, moving through the lake. If you are inspired, you can prepare yourself a few fishing rods for the full enjoyment of life. Other programs for reference: Hanoi City Tour, Sapa Vietnam Tours, Halong Bay Cruises, Hoa Lu Tam Coc 1 Day Tour.